Are you searching for the perfect porch swing? We at DutchCrafters are here to help you find the swing of your dreams. The swing that will bring a smile to your child's face as they enjoy their afternoons swaying in the breeze. The Amish handcrafted pine wood Fan-Back Swing offers ultimate comfort which is why it is one of our most popular porch swings. 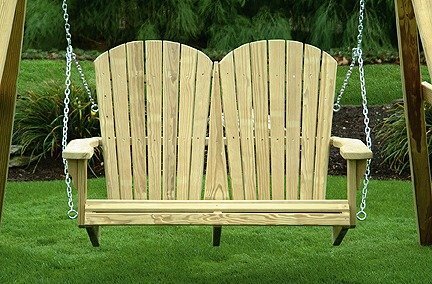 Amish Swings make a perfect gift for a wedding, birthday or anniversary. If you dream of Spring and Summer in the cold winter months then its likely you are dreaming of lounging in the backyard on comfortable outdoor furniture. Add to your collection with our Amish Fan Back Swing in solid pine wood.